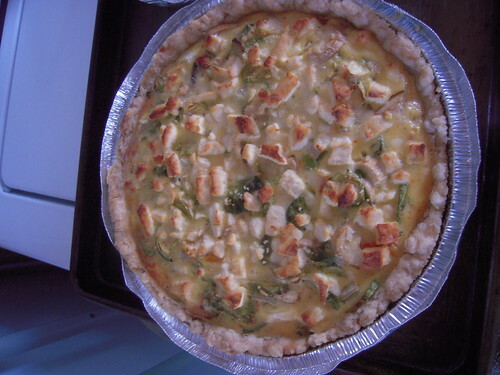 I was asked to bring quiche to a Christmas brunch with friends, but it’s been years since I made a quiche, even though I love it. This was as good a time as any to rev up my cooking skills. The proof will be in the eating! 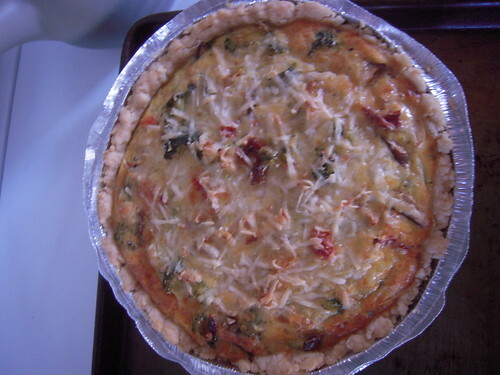 There is a lot you can do with a quiche, and it’s hard to go wrong with the ingredients. The basic mixture of eggs, milk and cream of some sort plus seasonings is fairly standard. Some people bake the crust first in a blind-bake, but I’ve always had good luck just putting it in the raw crust. I think it’s the addition of a little flour in the egg mixture that does the trick. Others swear by coating the crust with egg white. Whatever works, right? Pour boiling water over ¼ cup of sun-dried tomatoes. Let this soak while you do the rest of the preparation. Sauté the following in a little extra virgin olive oil, or do what I did and nuke the veggies about 2 minutes to soften them. Beat until smooth, then add ½ cup grated cheese (variations below). Drain and chop the soaked sun-dried tomatoes and add to mixture. Pour over softened veggies and mix so all veggies are well coated. Pour all into unbaked crust and bake about 50-60 minutes until brown and firm in the middle. Mix the oil and milk until milky and well combined. Pour over the flour and salt. Mix well with a fork, then press the dough into the pan to make a nice crust. For this recipe, I used a 10-inch 1 ½” high tart pan with straight sides, but could be done in a regular pie pan (large). 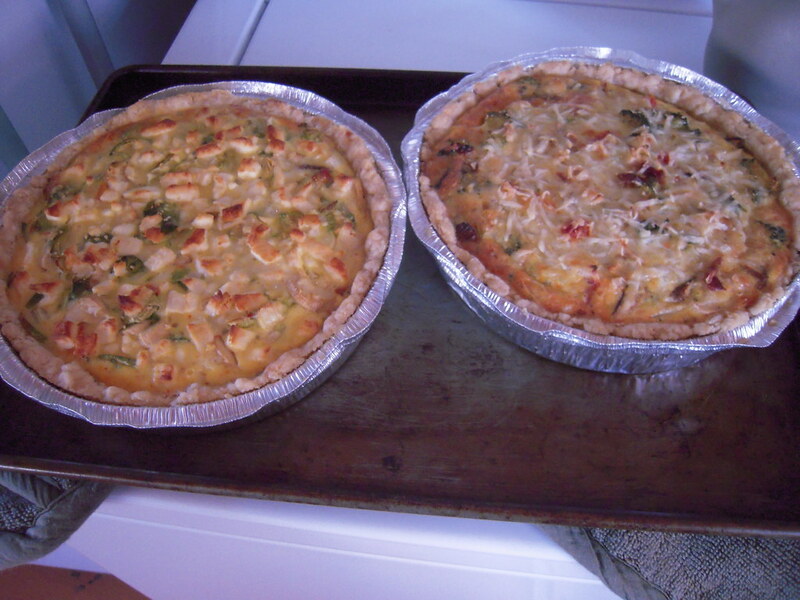 To make two quiches, I doubled the recipe and made them different. 1)	In one, I put 2 cups broccoli florets, used Swiss cheese, and topped it with freshly grated Pecorino Romano. 2)	In the other, I put 2 cups thinly sliced Brussels sprouts, used pepper jack cheese, added 1/8 teaspoon Thai red peppers (crushed) to the egg mixture, and topped it with crumbled feta. I grow the tiny Thai red peppers in a pot outside my kitchen door. Sometimes I use them fresh, 2 or 3 in a pot of soup or stew. The ones I used for this had been dried and kept in the fridge for whenever I need dry red pepper flakes. NOTE: Even with all the tasty ingredients, these both seemed a little bland. The one with Brussels sprouts, peppers, Jack cheese and feta seemed a bit tastier, but could have used even more of the peppers. Previous Previous post: Mele Kalikimaka!